The 1971 Attica prison uprising is a signature moment of radical resistance for the American Civil Rights movement. The bloody retaking of the prison however, is an open wound. Utilizing rarely seen video recordings, Evidence of the Evidence explores this tortured history. It offers a visceral account of the events at Attica, and chronicles the mediation and narrativization of these events. In so doing, it reflects on the role that moving images play in the production of history and memory, its creation and its destruction. "NOW! AGAIN! is a reenactment of a classic radical film, "Now!" 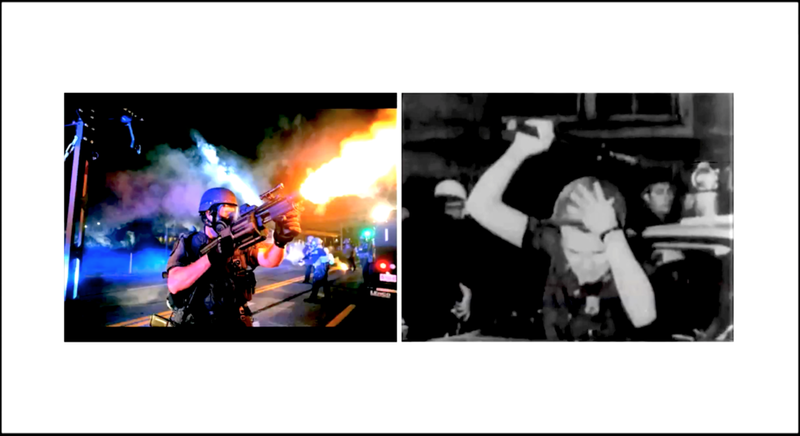 by Santiago Alvarez, staged this summer in Ferguson, Missouri by the cops themselves. Playing themselves, the cops reenact their own vicious history as if they were checking their performance in a mirror shattered by gunfire. NOW! AGAIN! blows up at the intersection of an avant-garde film act and an urgent manifesto for militant action, demanding an end to police violence NOW!" "A Costly Lesson is a strange, mournful bird: an artifact of a forgotten past that arrives on the schedule of this week’s newsreel. More of less, it constitutes the scant findings of Johnston’s investigations into the 1913 suffocation of 8 black convicts in a Texas prison. Yet rather than reading as a document of a past time, it reads like a transcript of our nightmare present: black teenagers in prison, abusive work conditions, racist cops, a murderous response to resistance, 8 dead teenagers . . . and nobody does anything about it. Johnston does what he can. He honors them with dignity, beauty, restraint. He answers the questions he can answer: who, where, when, how. The only missing interrogative is why. But he answers that too, almost automatically, by answering the preceding questions themselves. One of the true horrors of racism in the United States is that it obliterates questions of why as part of its existential firestorm. Simply say that a victim of violence in the United States is young, black, and poor, and we already know how the story will end. It’s a lesson we learn over and over. It’s a lesson we never seem to learn." The ghosts of America’s radical past make themselves known in Way down in the Hole. Enlisting contemporary interviews, archival materials and a propulsive musical score, this short documentary journeys to the heart of one of the most violent episodes in American labor history, the Great Colorado Coalfield War of 1913-1914. Indebted as much to Barbara Kopple’s Harlan County USA as to the gritty revisionist westerns of Sam Peckinpah, the film is a meditation on class struggle, national identity, and violent insurrection, played out across the wild frontier of the industrial American west. An intimate portrait of legendary labor historian/activist and folklorist Archie Green, Learning to Bend Steel focuses on Green's early days as an aspiring shipwright on the dry docks of 1940's San Francisco. It is a meditation on the nature of labor, a chronicle of Green's early embrace of worker's culture, and a precious glimpse of San Francisco as a working class city, before its cultural annihilation at the hands of Silicon Valley tech oligarchs.